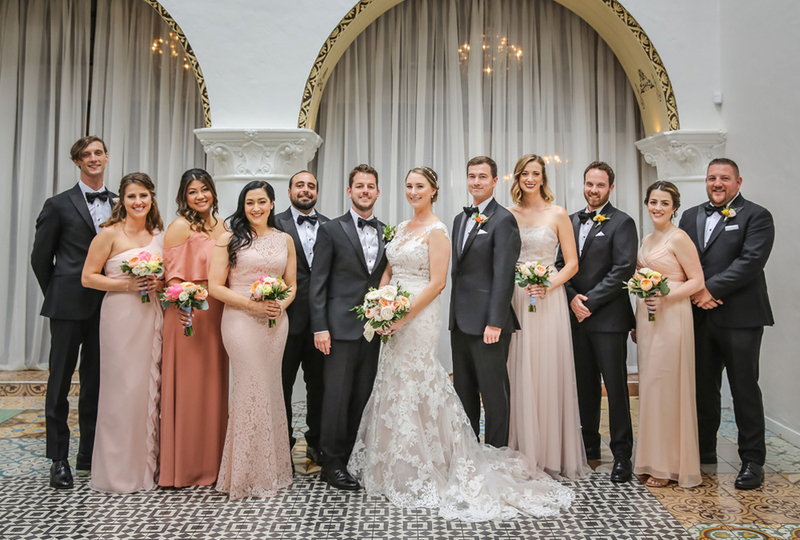 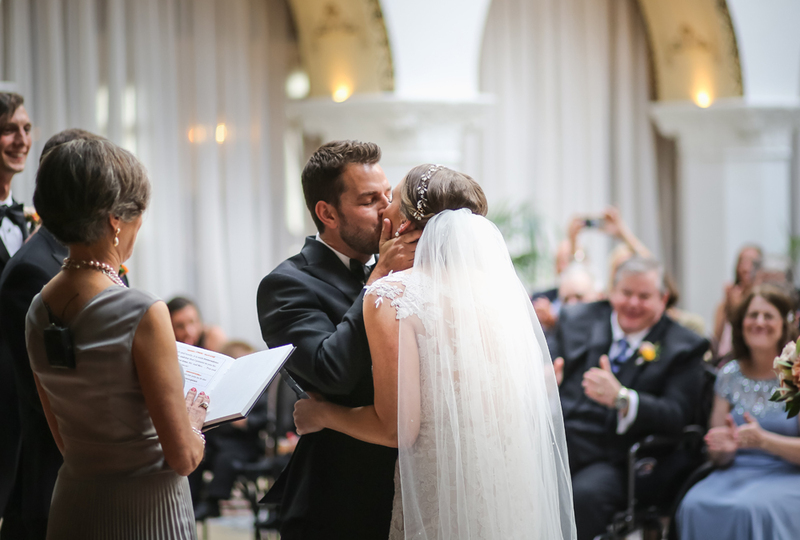 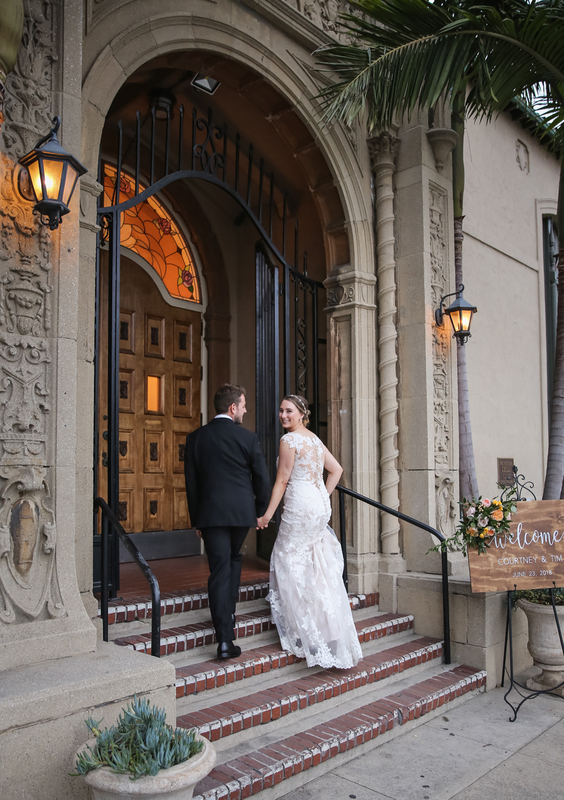 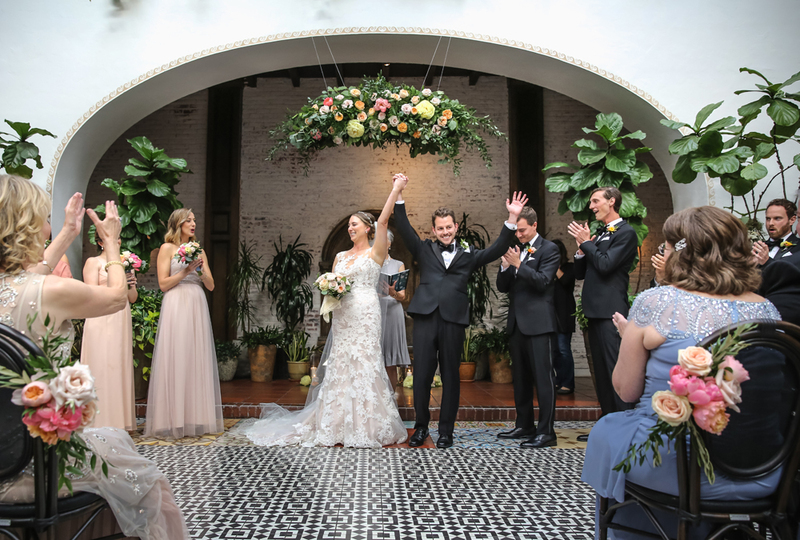 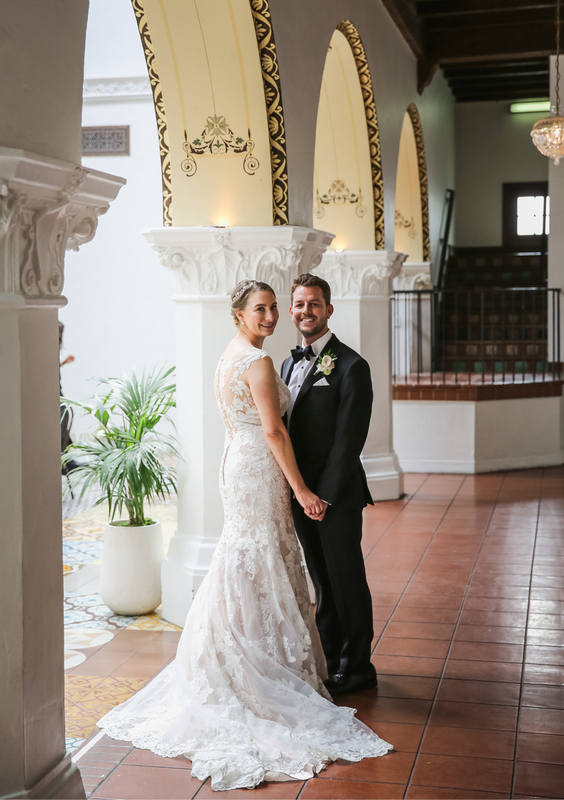 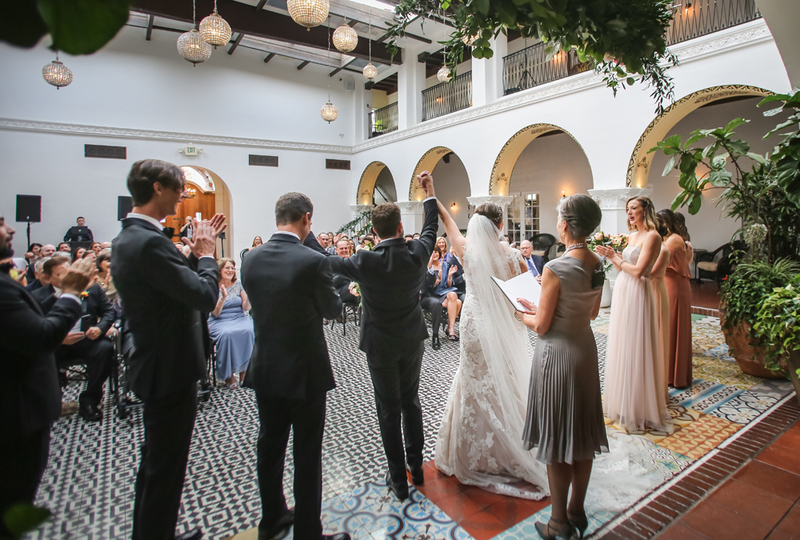 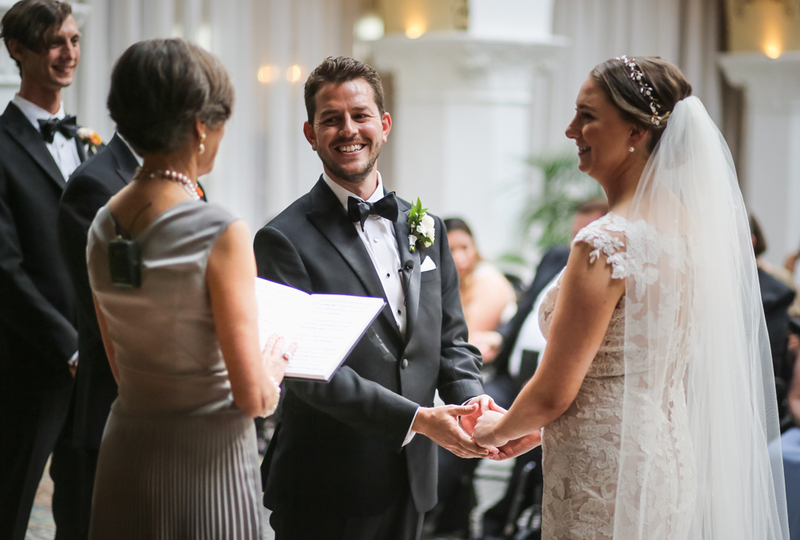 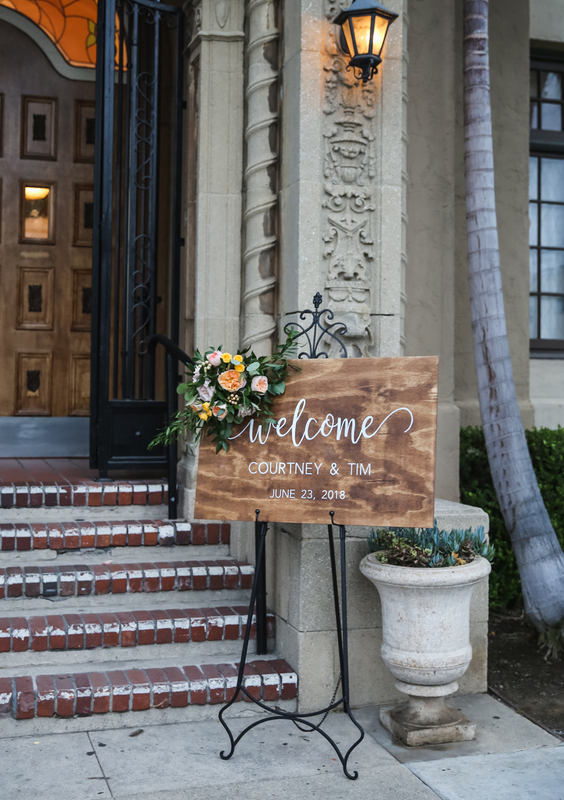 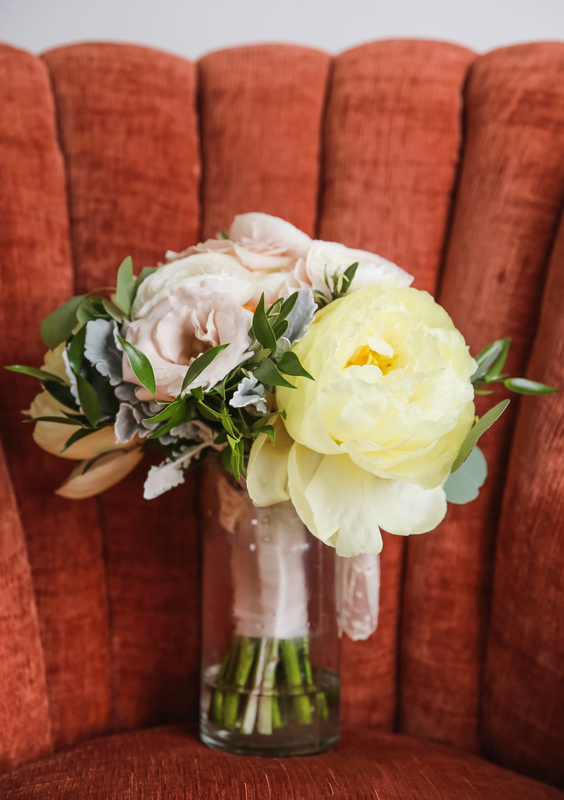 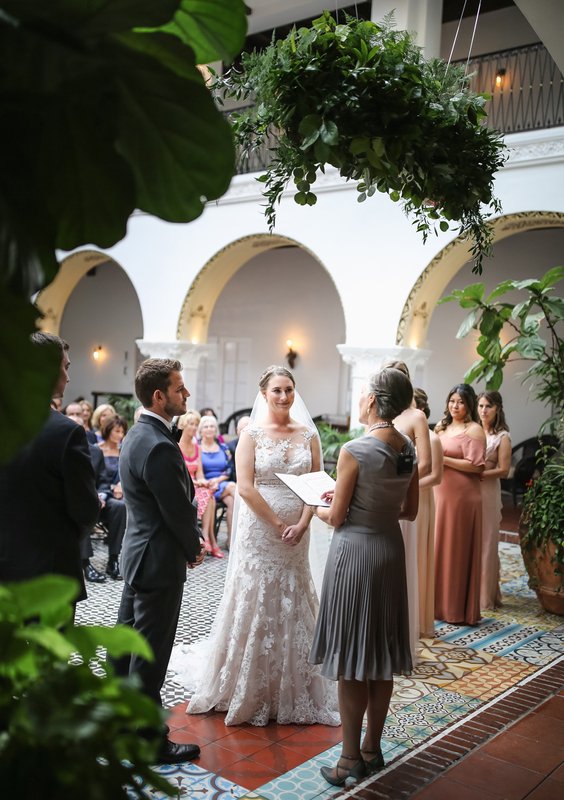 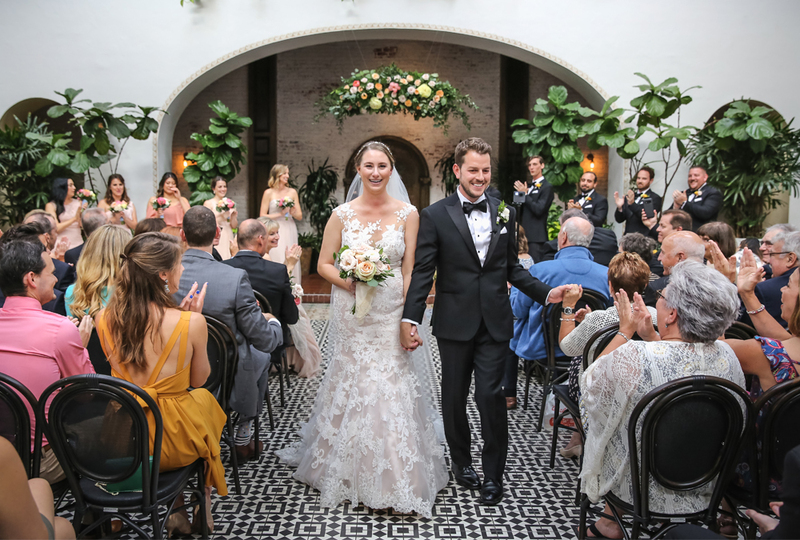 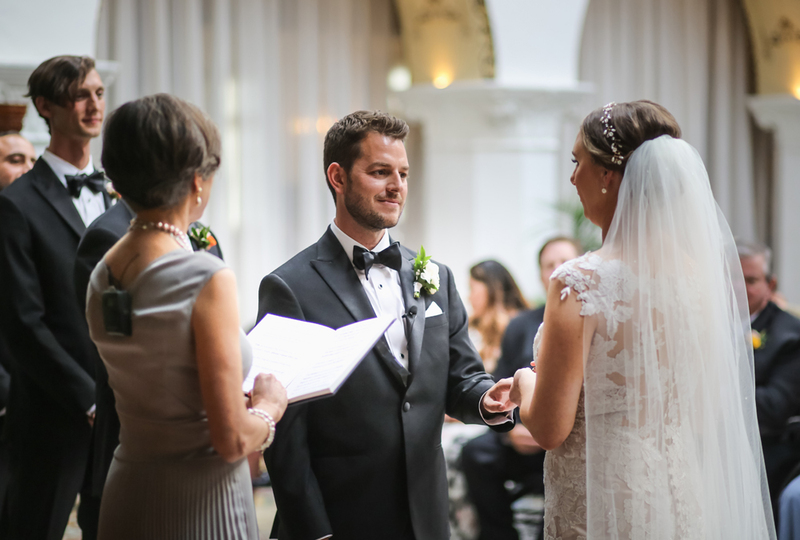 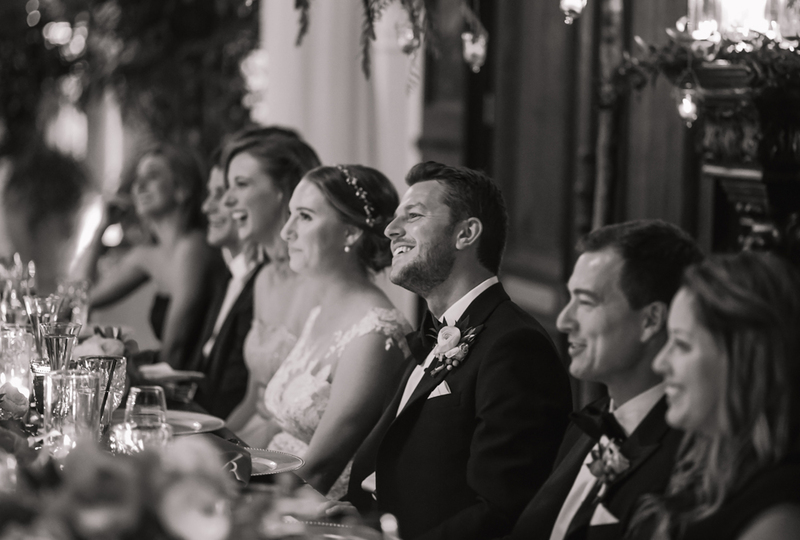 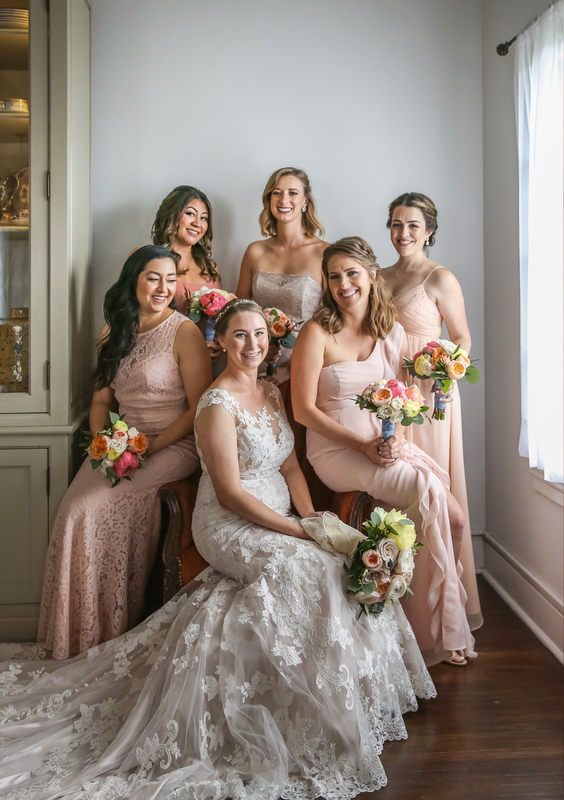 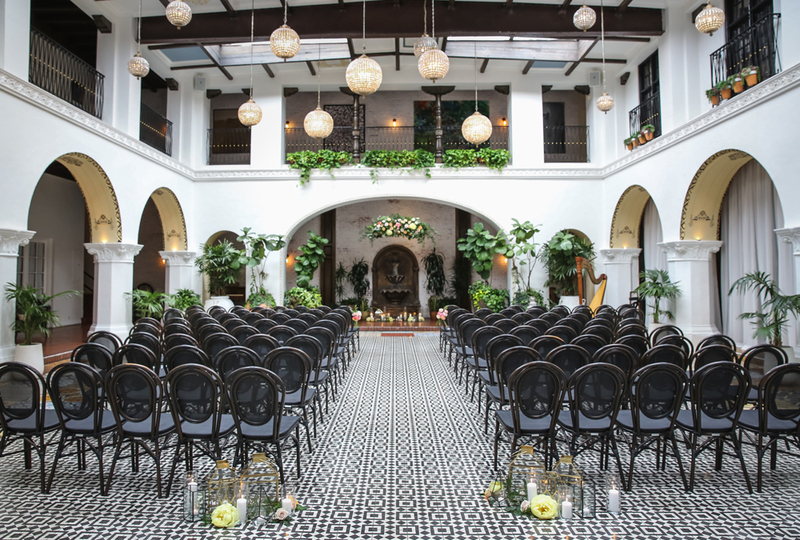 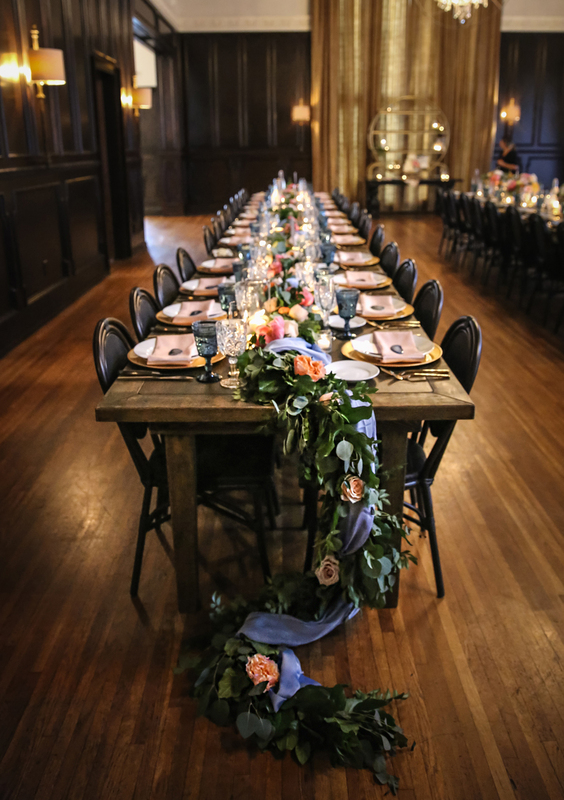 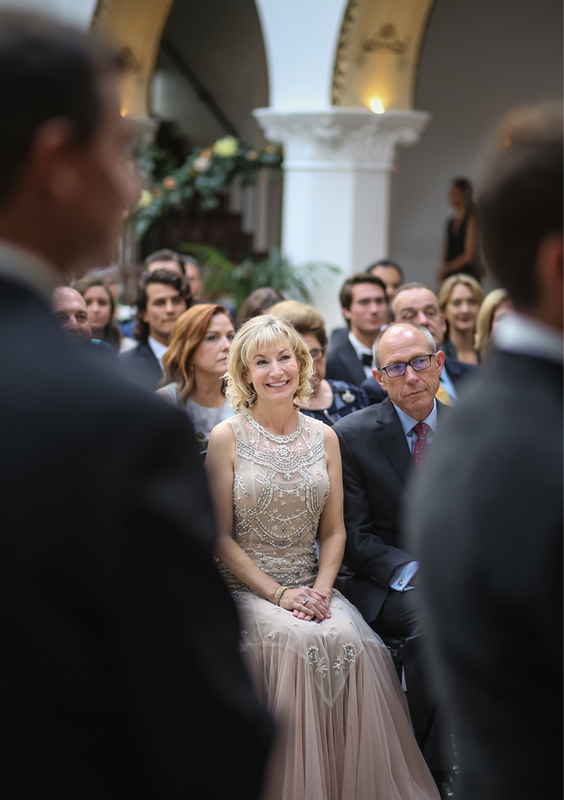 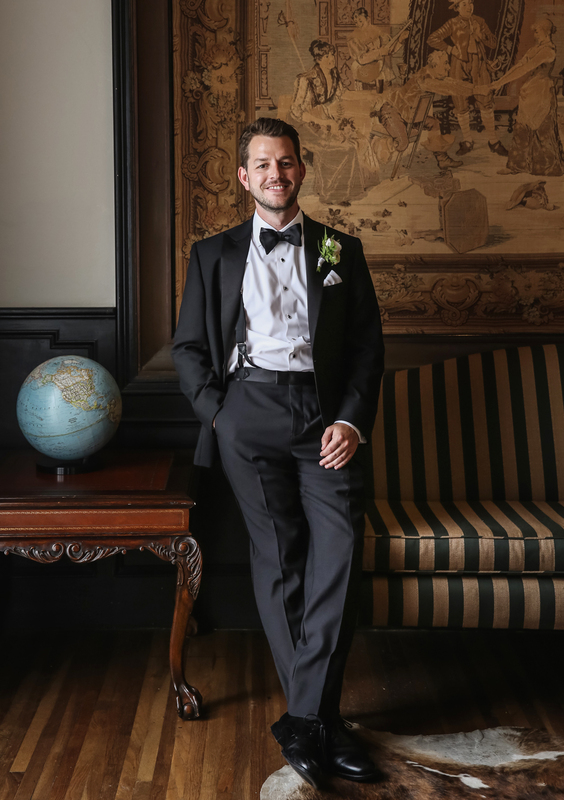 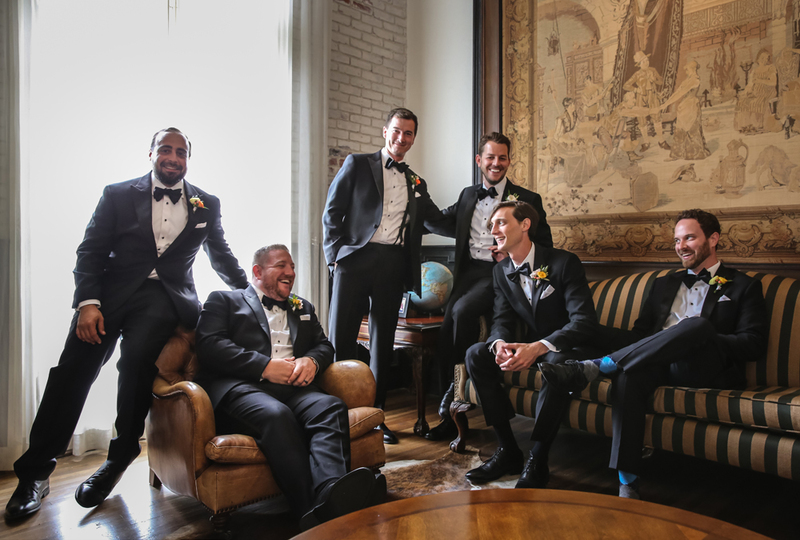 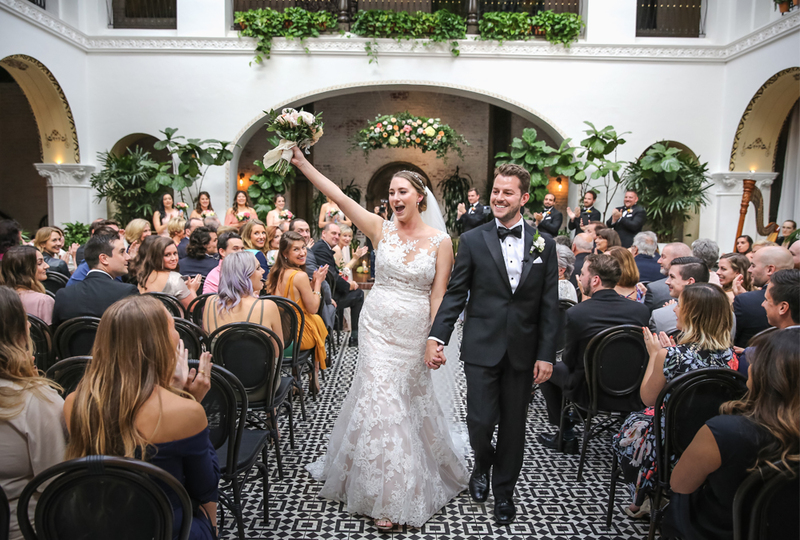 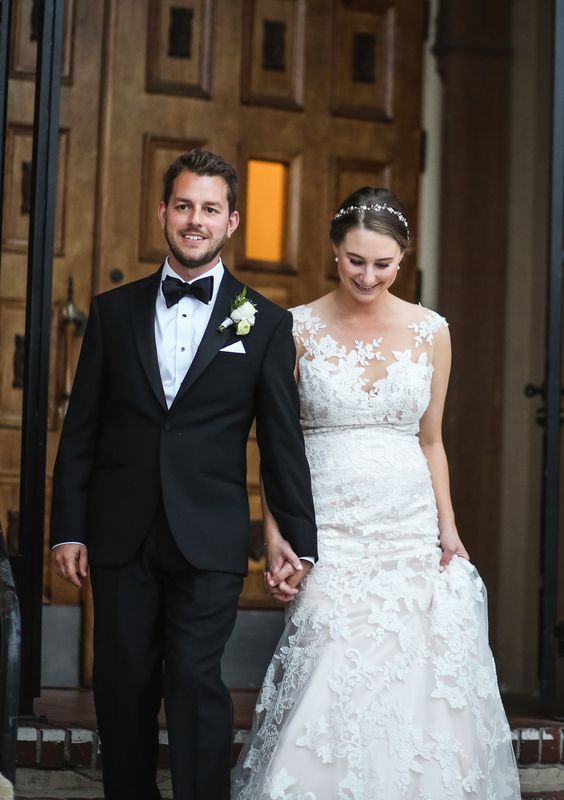 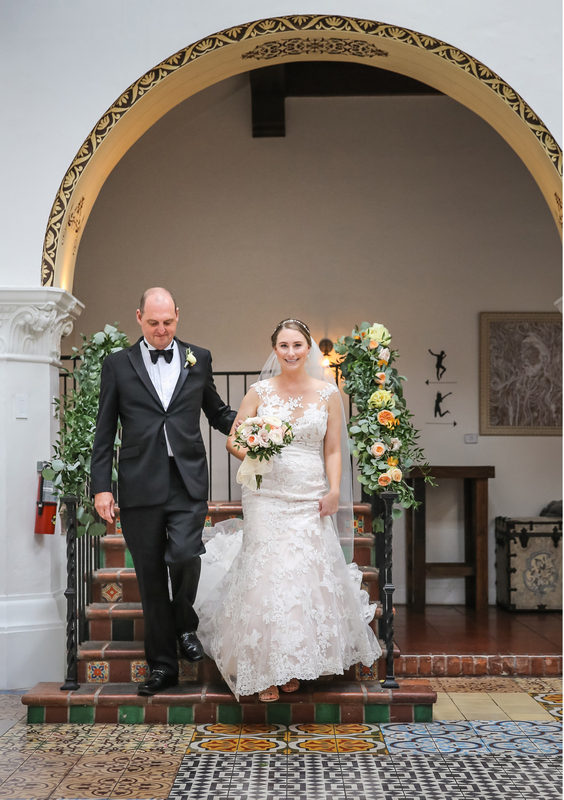 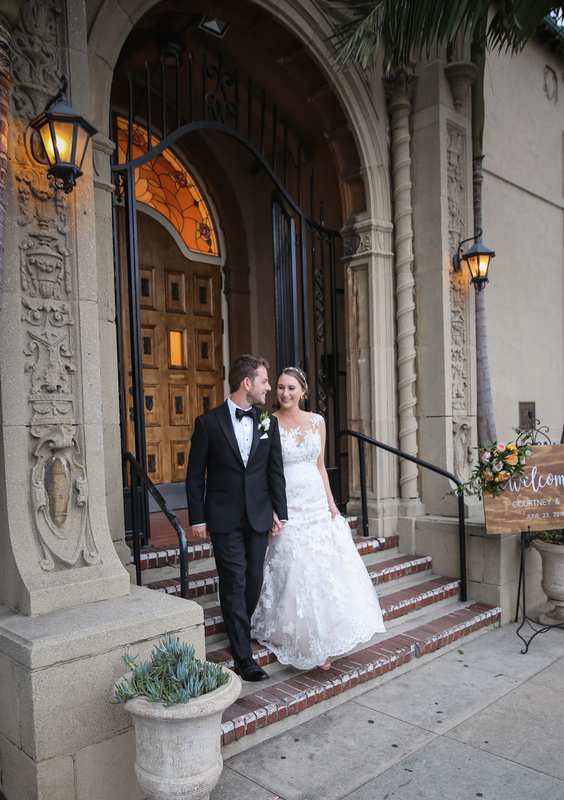 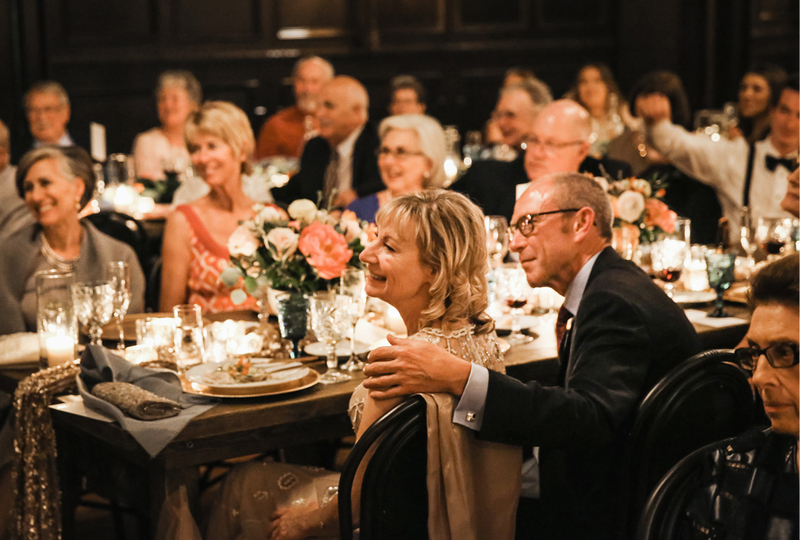 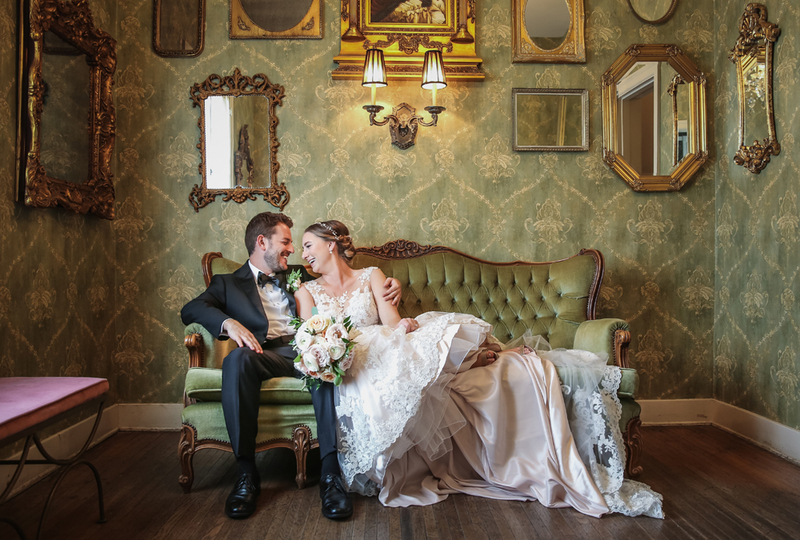 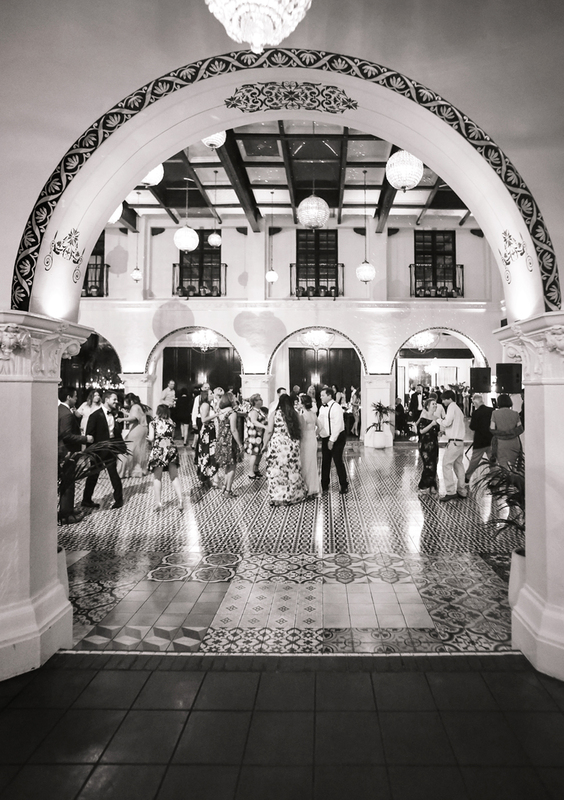 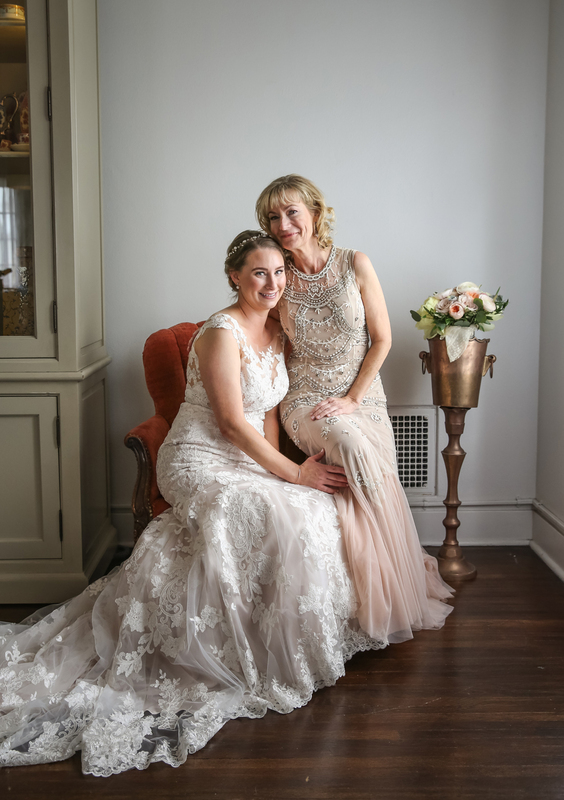 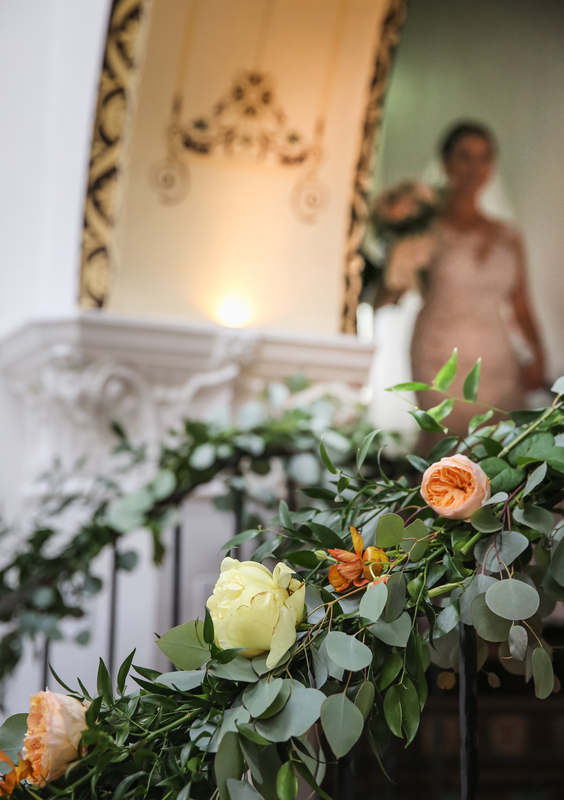 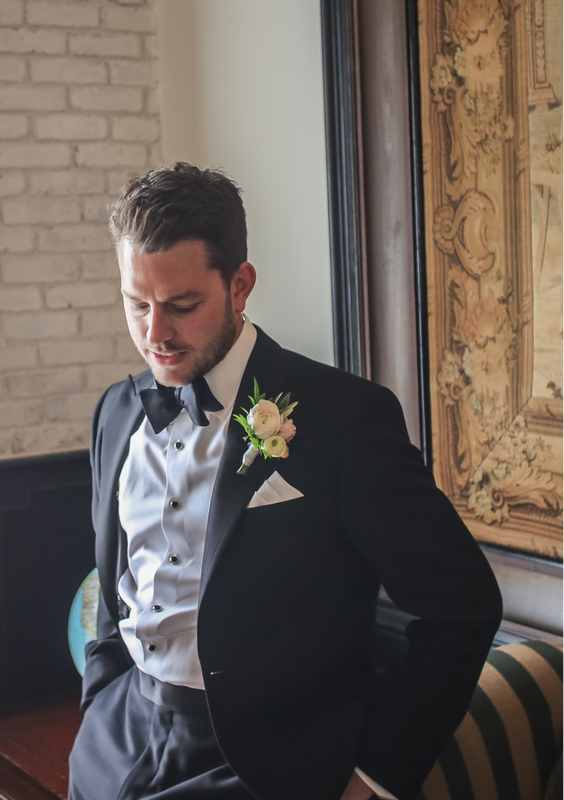 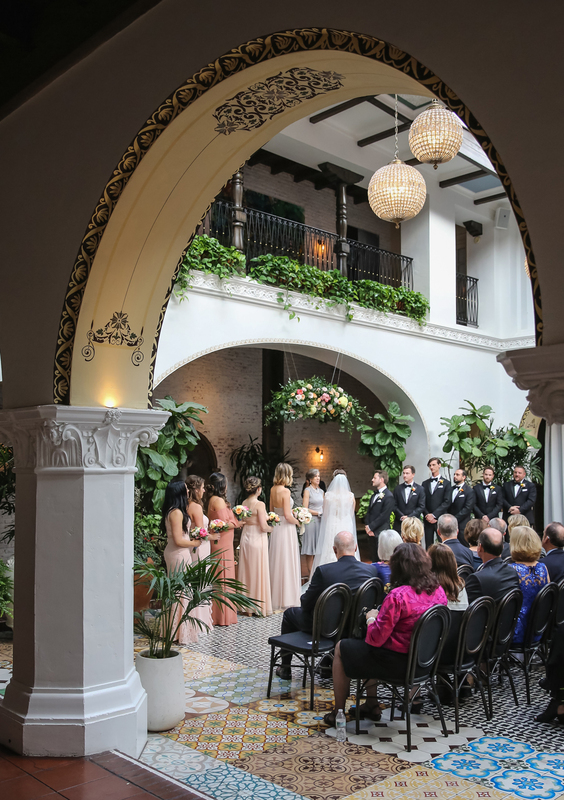 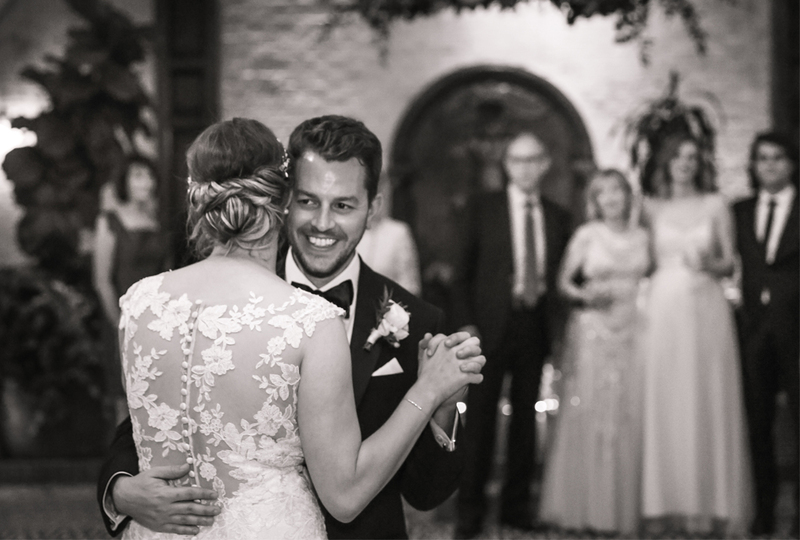 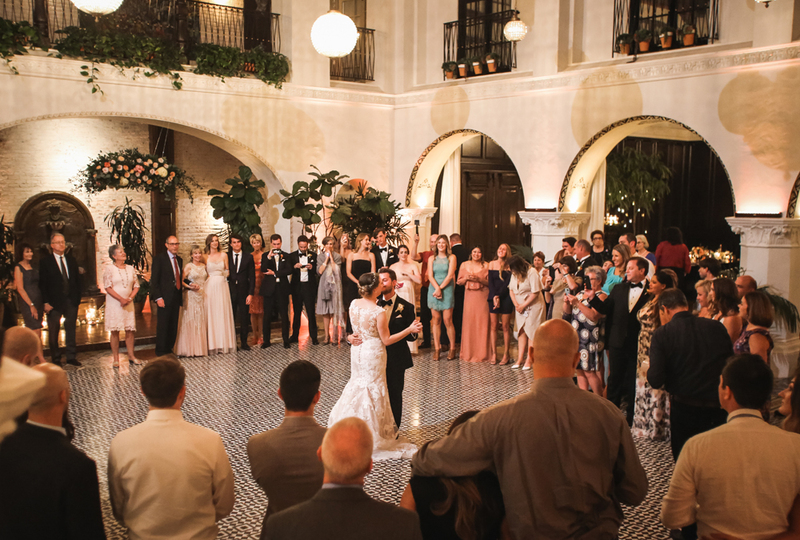 The Ebell of Long Beach is an extraordinary venue and the perfect setting for celebrating Tim and Courtney’s love story. 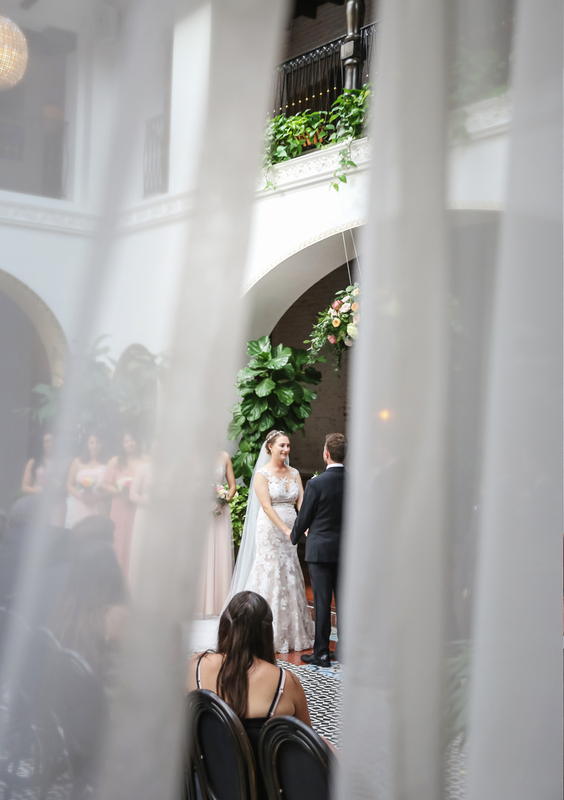 The open archways and natural daylight spaces are a photographers dream. 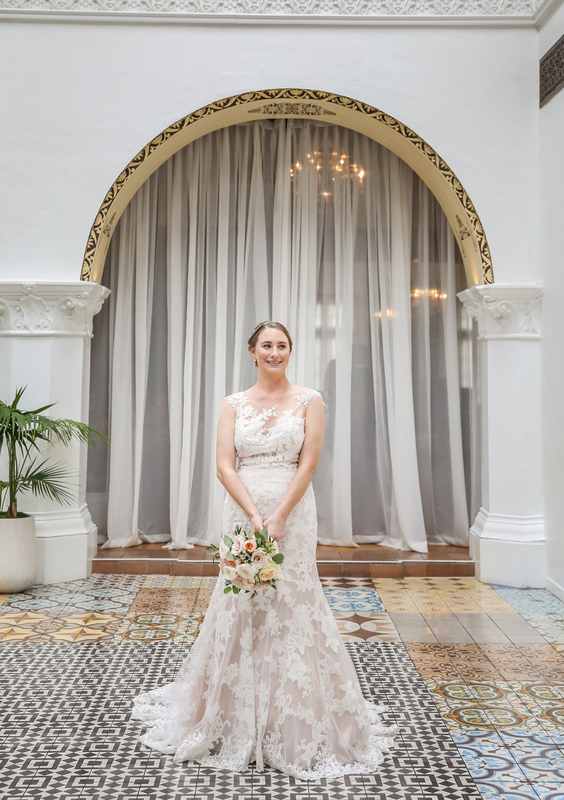 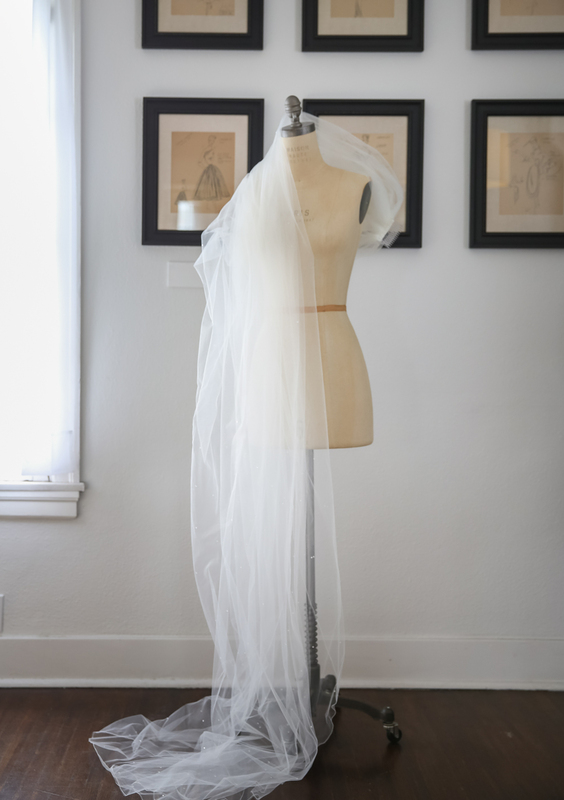 The bride’s dress by Pronovias is a personal favorite. 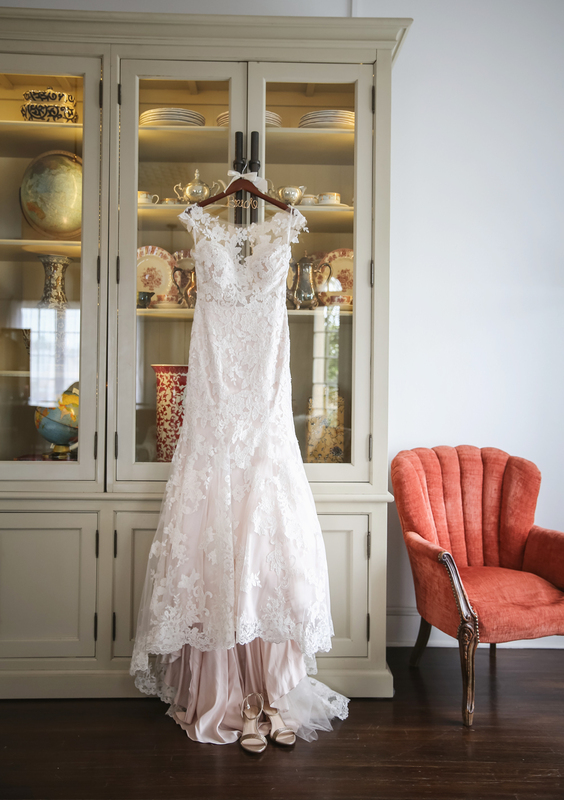 The beauty of the lace over the blush colored, luxurious silk slip had me at first sight. 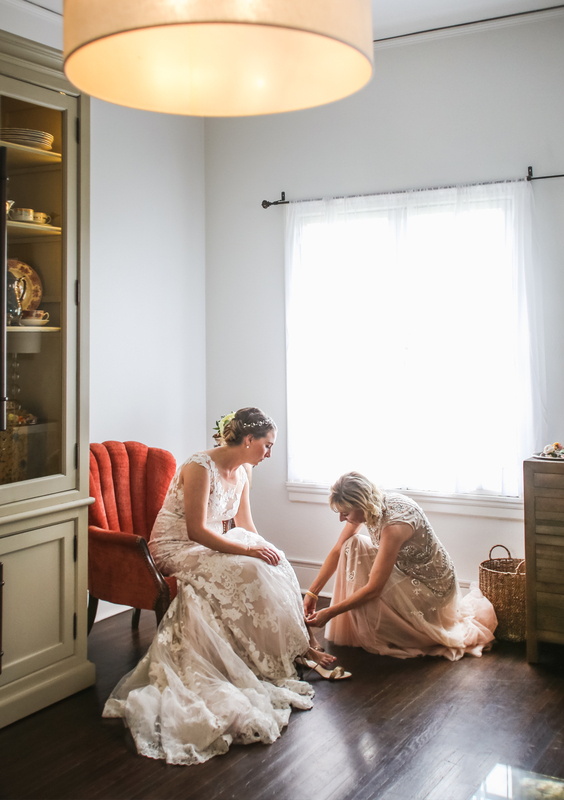 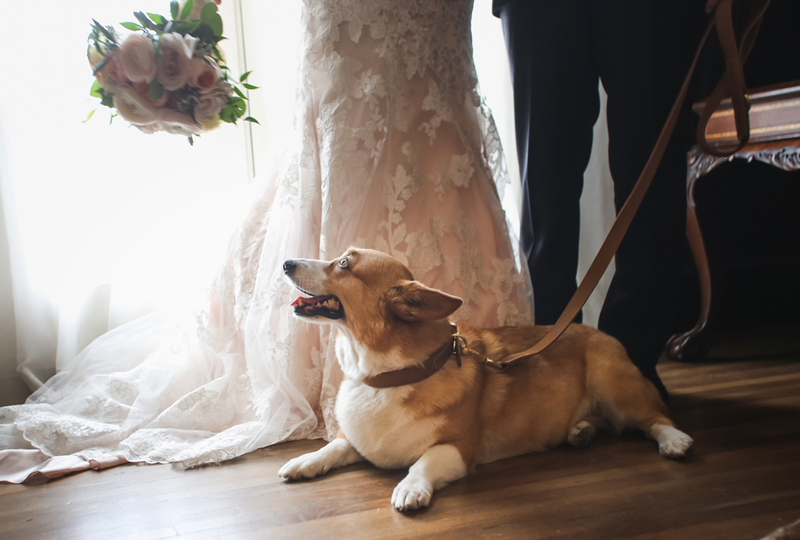 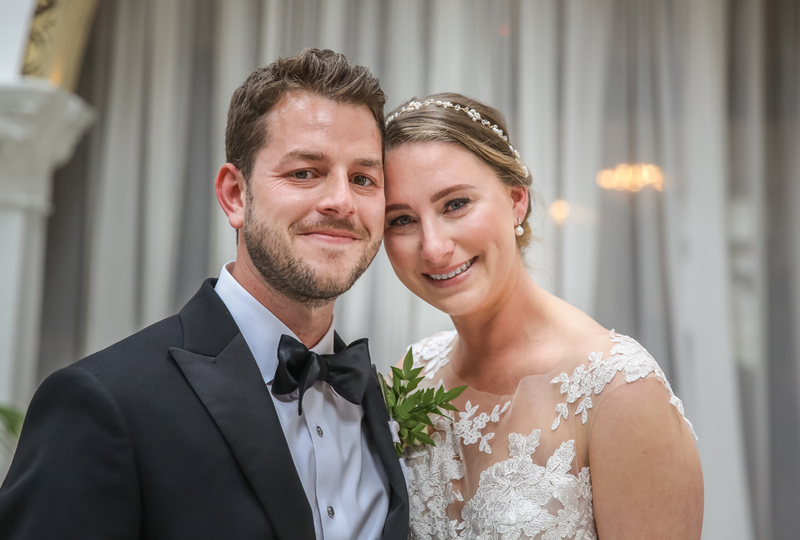 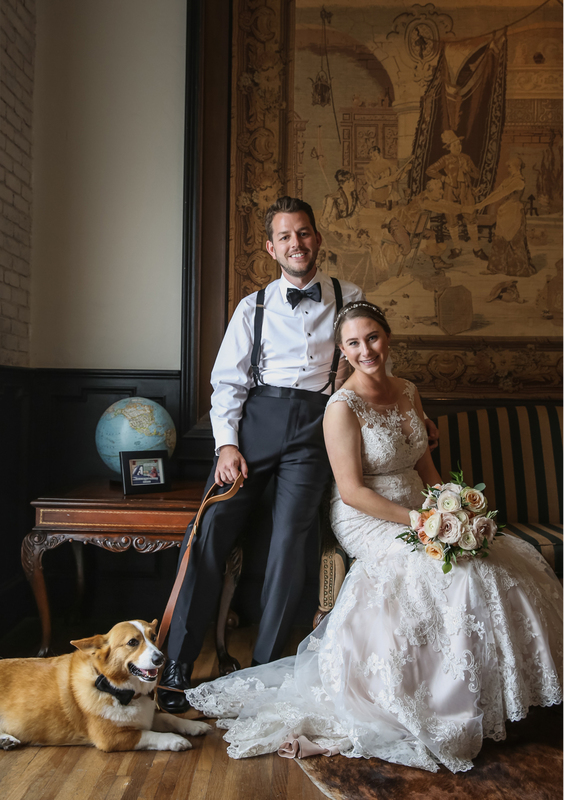 Before the ceremony the couple met in the natural light foyer to share a first look and to greet their sweet pup, Winston. 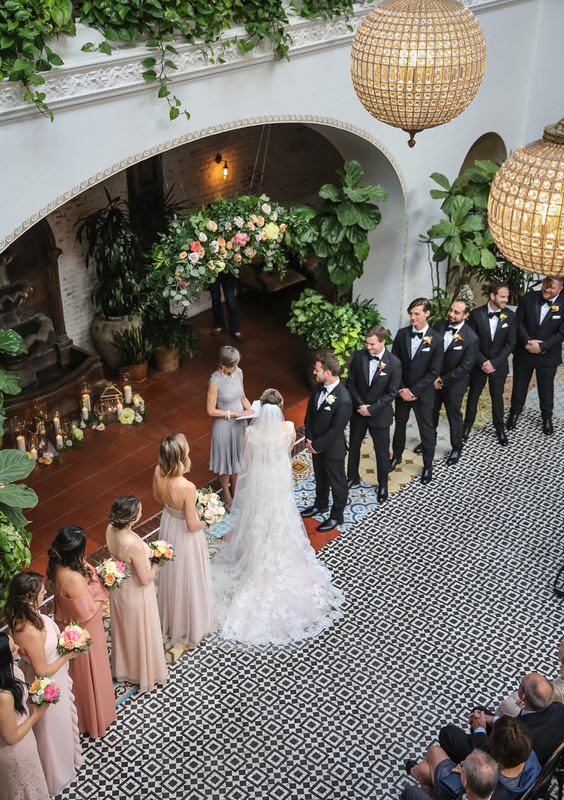 The ceremony was absolutely beautiful. 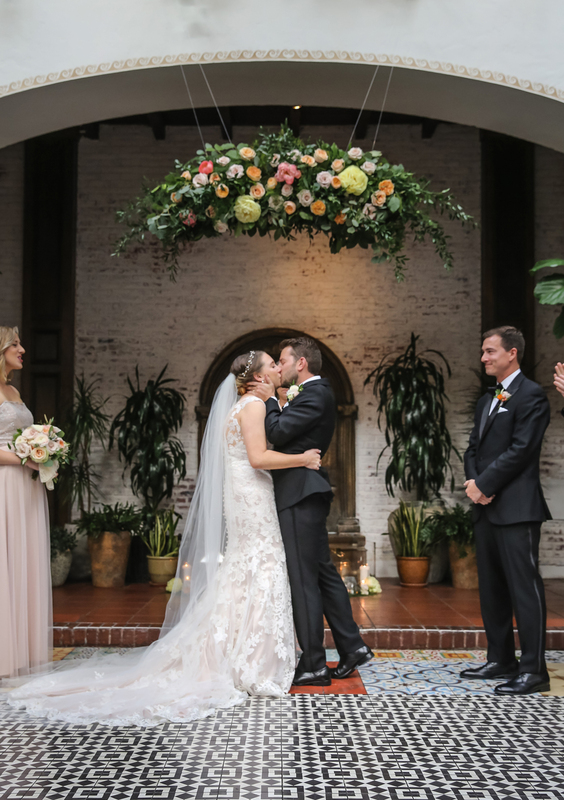 The floral arbor designed by Bottles and Blooms looked stunning above the mosaic tile floors and the lush greenery set along the aisle. 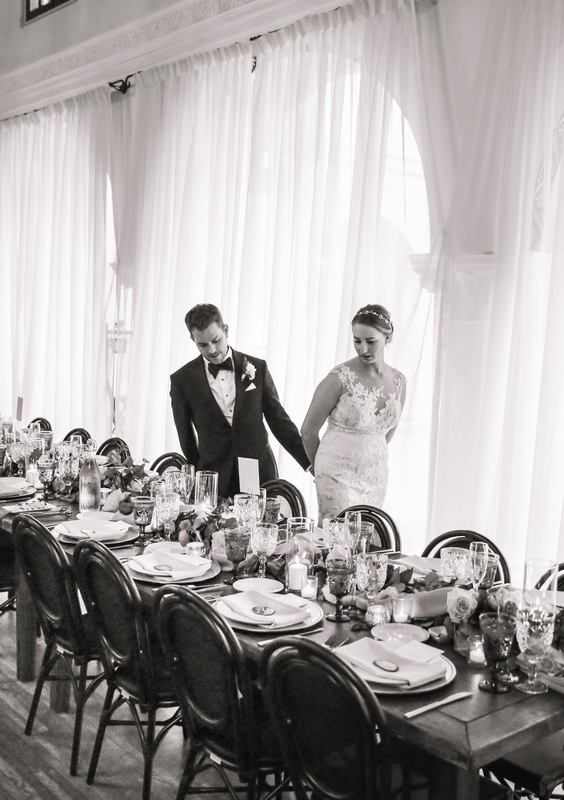 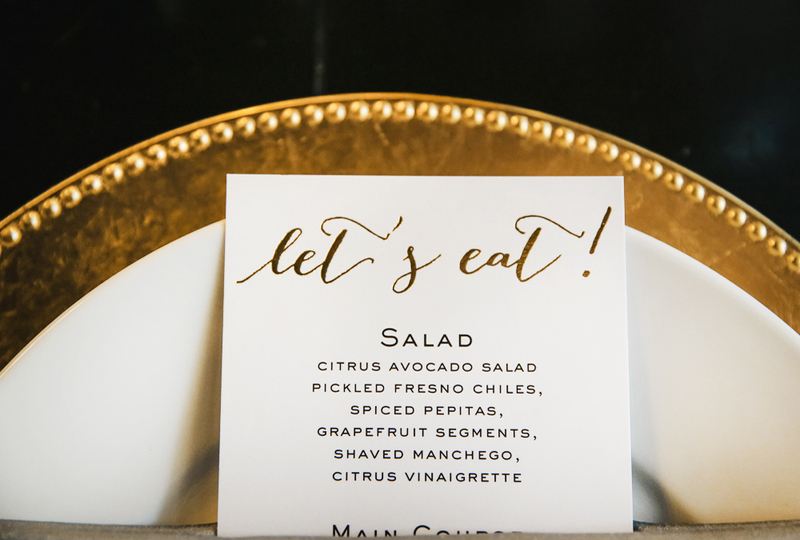 The couple chose long dark trestle tables for their reception with pale blue and gold accents. 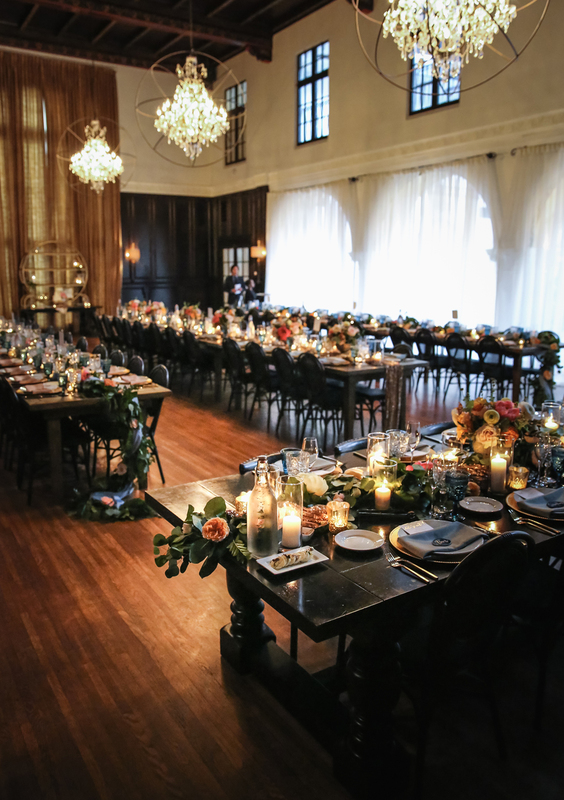 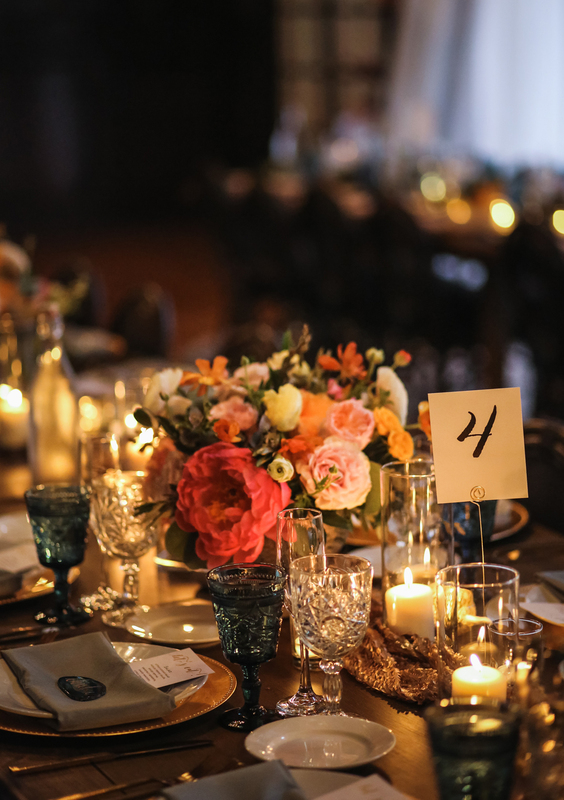 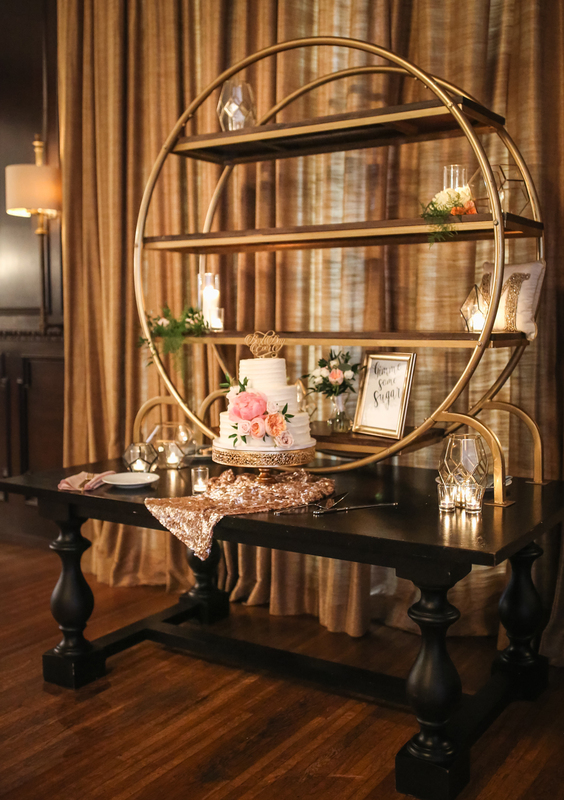 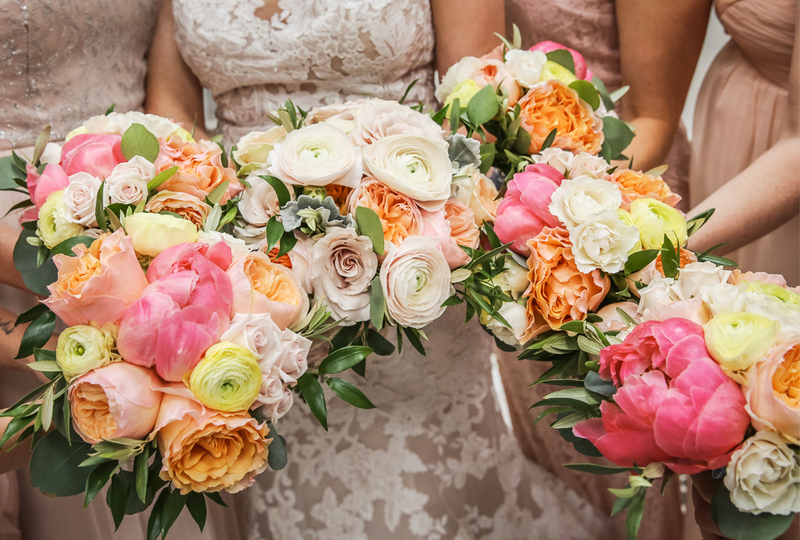 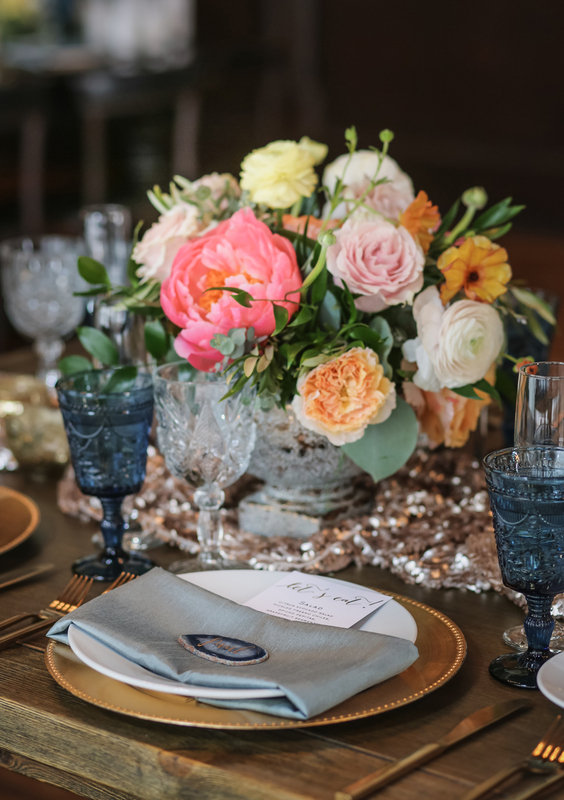 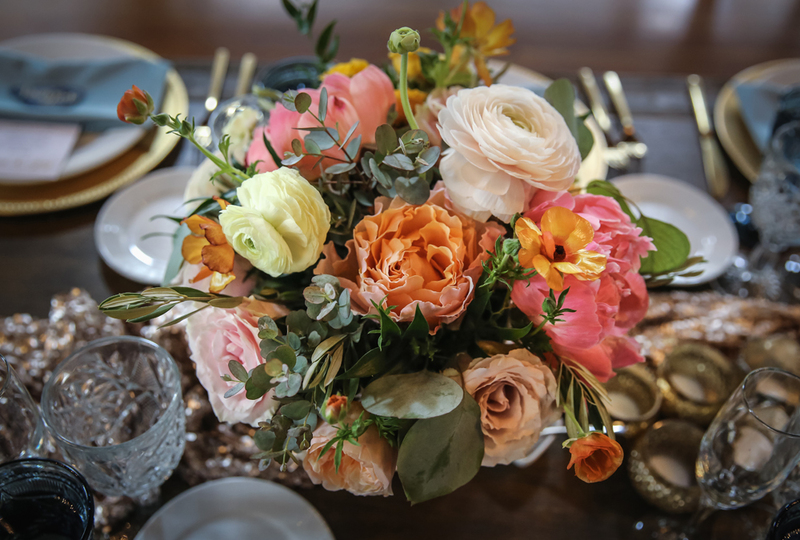 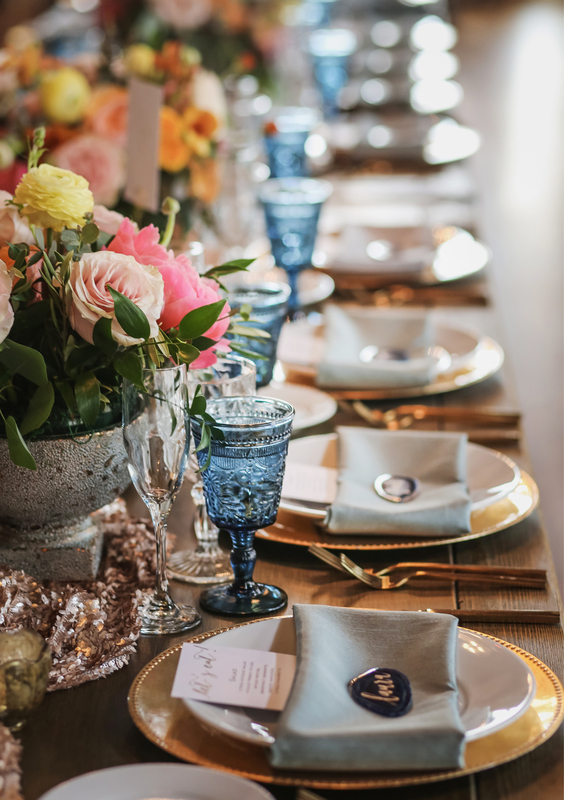 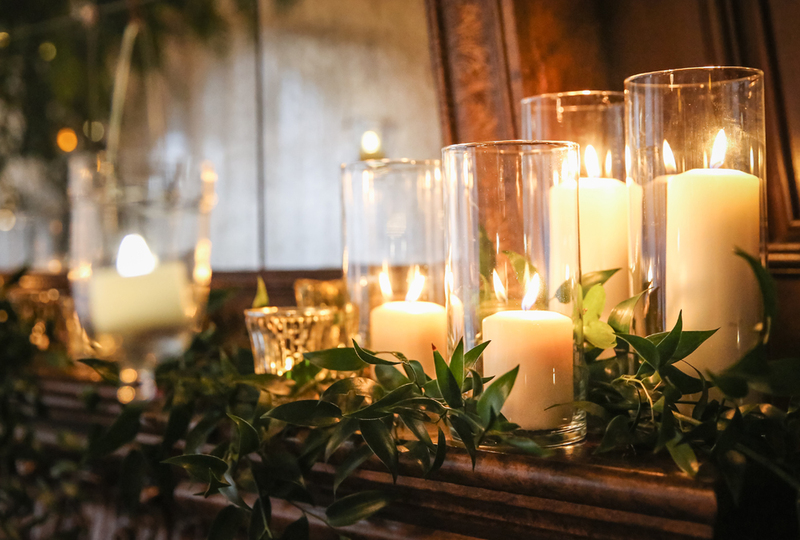 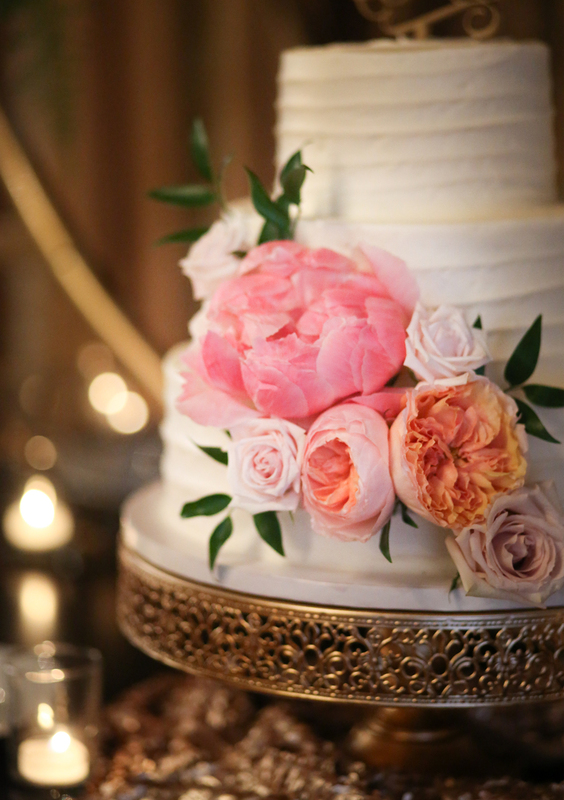 Soft hued, luscious blooms and garland, gold sequin runners and hundreds of twinkling candles were displayed down the center of the tables. 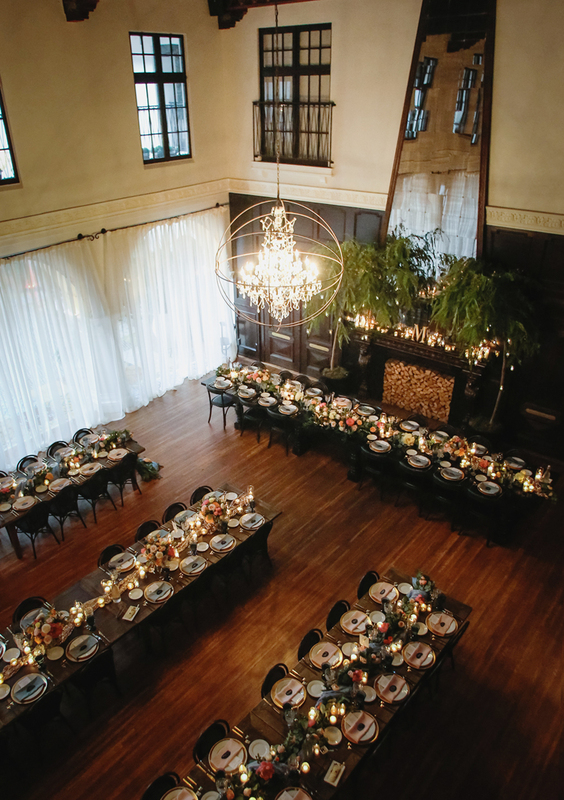 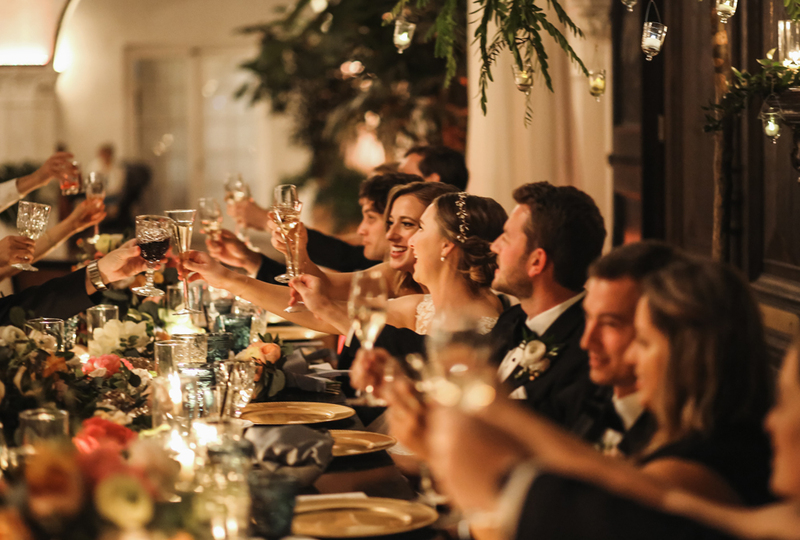 The head table where the bride and groom dined with the wedding party was framed on either end by tall green trees adorned with hanging baubles of light. 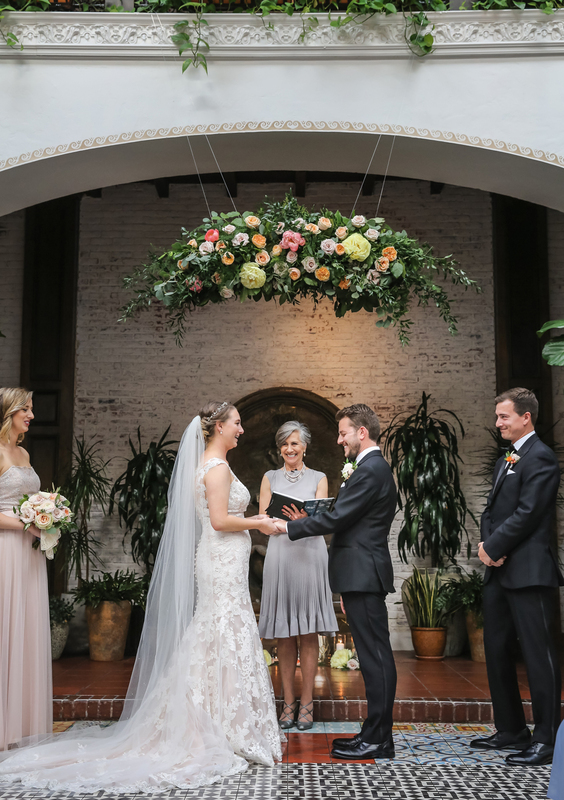 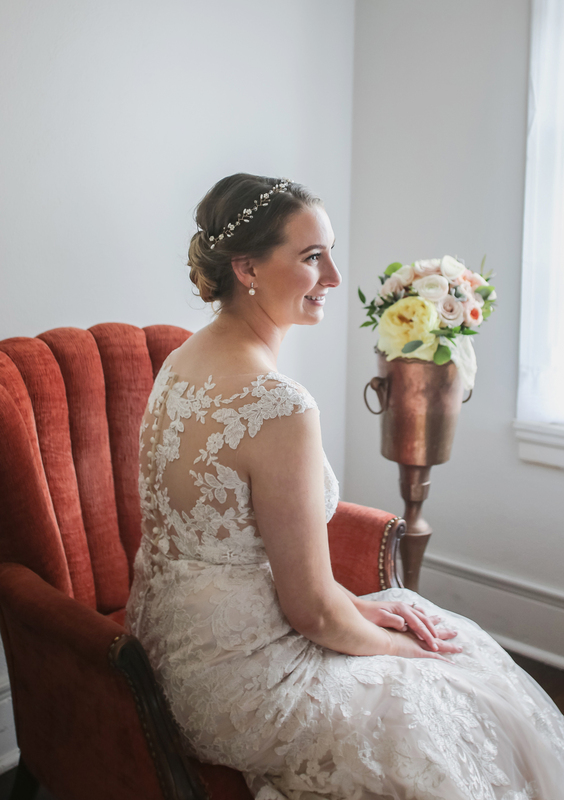 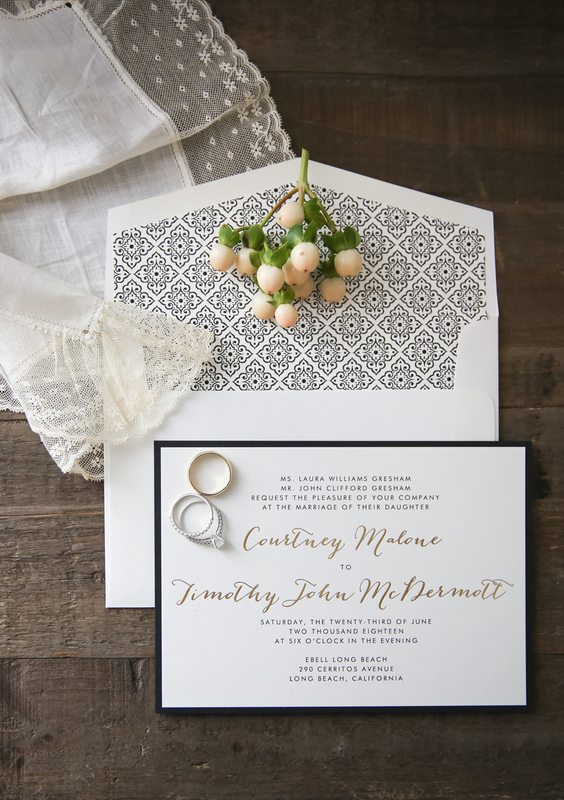 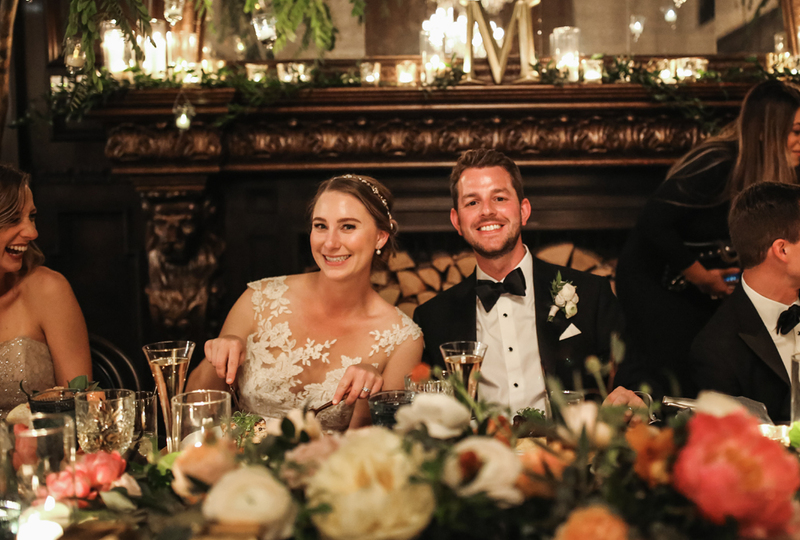 The look was magical against the dark wood walls and high vaulted ceiling. 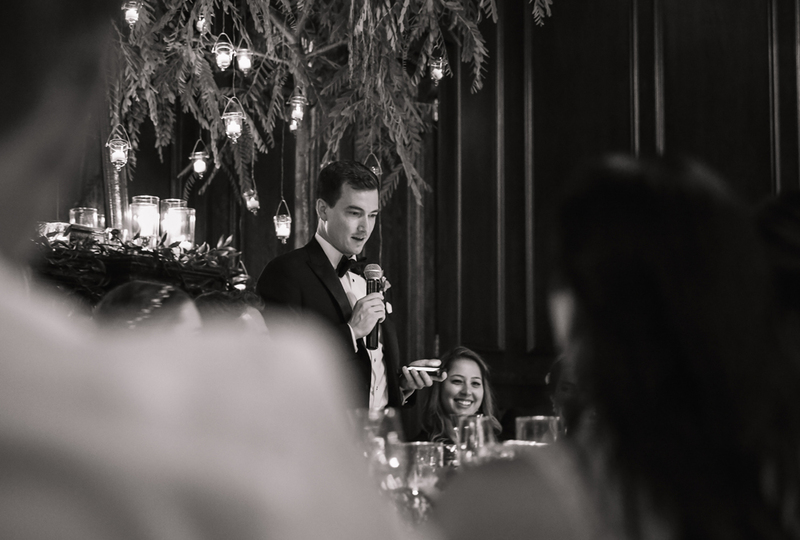 The father of the bride, maid of honor, and best man gave speeches after dinner. 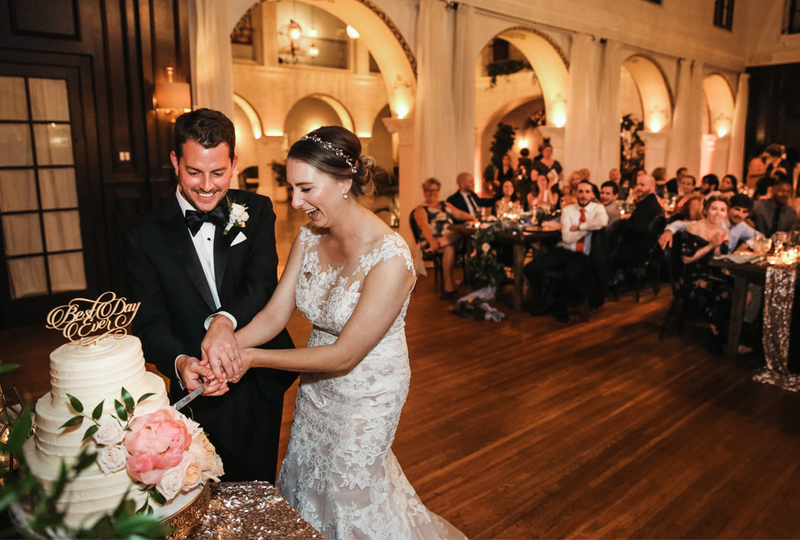 Then Courtney and Tim cut the cake before dancing began.